Now you can quickly and easily estimate the cost of all types of public works projects involving roads, excavation, drainage systems and much more. 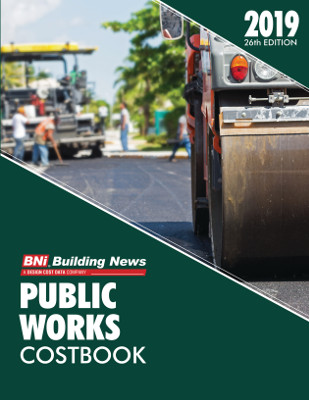 The BNi Public Works Costbook 2019 is the first place to turn, whether you’re preparing a preliminary estimate, evaluating a contractor’s bid, or submitting a formal budget proposal. It puts at your fingertips accurate and up-to-date material and labor costs for thousands of cost items, based on the latest national averages and standard labor productivity rates. What’s more, the BNi Public Works Costbook 2019 includes detailed regional cost modifiers for adjusting your estimate to your local conditions.